Cloud Accounting systems are eliminating many of the data entry and reconciliation chores of running accounting software. Bank feeds, invoice scanning, automated and machine learning are making bank reconciliation a button press. These systems all have web based databases so access to data and reliability is greatly improved. These systems have open interfaces or API’s so many add-on applications can be inexpensively sourced. Applications of mobile phones are performing billings and payments. If you are an accounting practice or bookkeeper providing services to small business then this access and sharing has meant an enormous increase in productivity. However it is this same automation that is creating a reduction in the hours you can bill. Savvy practitioners will see this freedom from burden as an opportunity to create higher value services. You are Johnny-on-the-Spot and you’ve seen more businesses, successful or not, in one year than many see in a lifetime. Who better to provide advise, implement systems to monitor strategy or help measure business performance than you? You need Advisory Tools that scale – not spreadsheets. You need tools that you help you monitor many business but as access your clients data and give them tools to help them run there business. 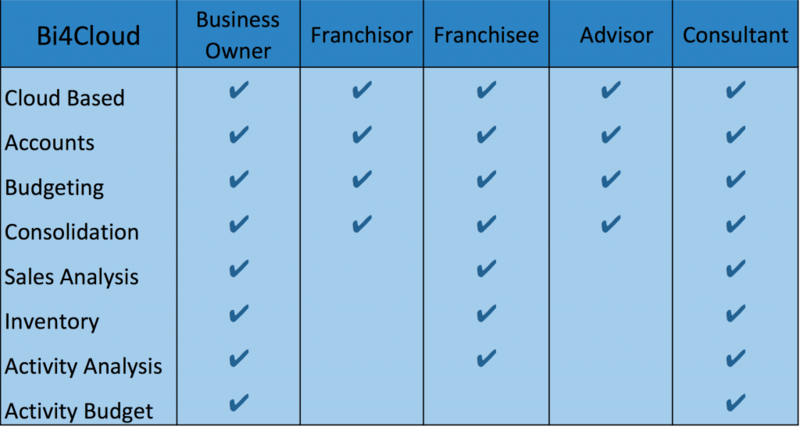 When you to crunch through the numbers to fathom which franchisee needs to be under the spotlight, use Bi4Cloud as the one reporting and charting tool that can dig into the detail and delivers top to bottom. 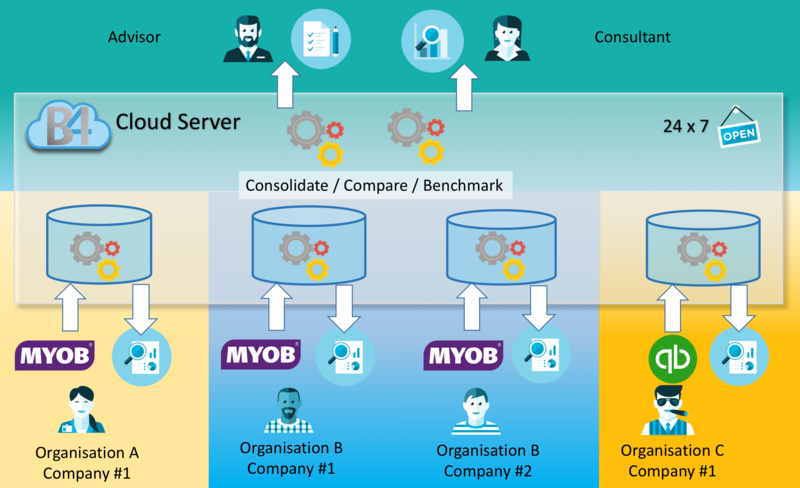 With BI4Cloud Business Owners synchronise their accounting system data with our BI4Cloud servers and transform their data into powerful, dynamic, multidimensional reports and visualisations. Make better business decisions. Advisors and Consultants use the same data to provide Consolidation, Comparatives and Benchmarking with Charts, Tabular reports in summary and exquisite detail. Spark charts simplify multi-group analysis. Information button reveals more detail and click to detail drills to the tabular presentation to make decisions and take action. Reports can be modified, saved as favourites, shared or scheduled to email. 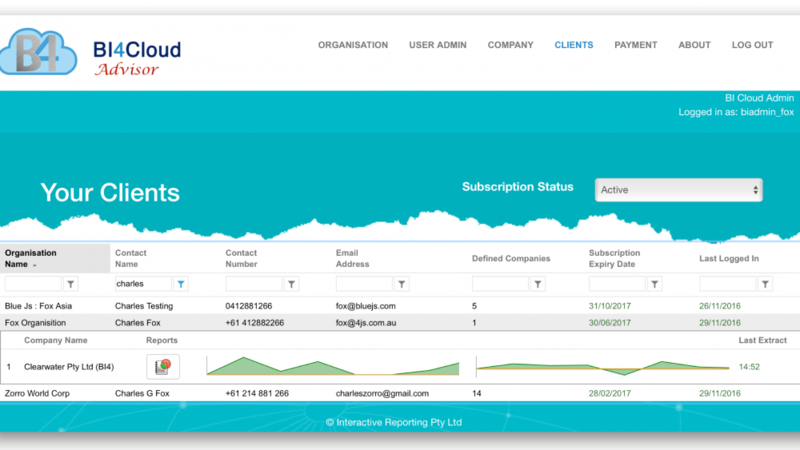 View your clients usage and activity statistics to minimise churn. 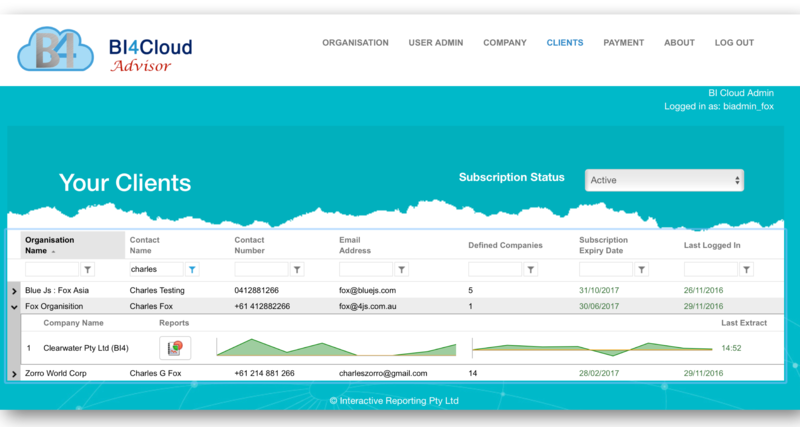 A unified reporting platform for both you and your clients.